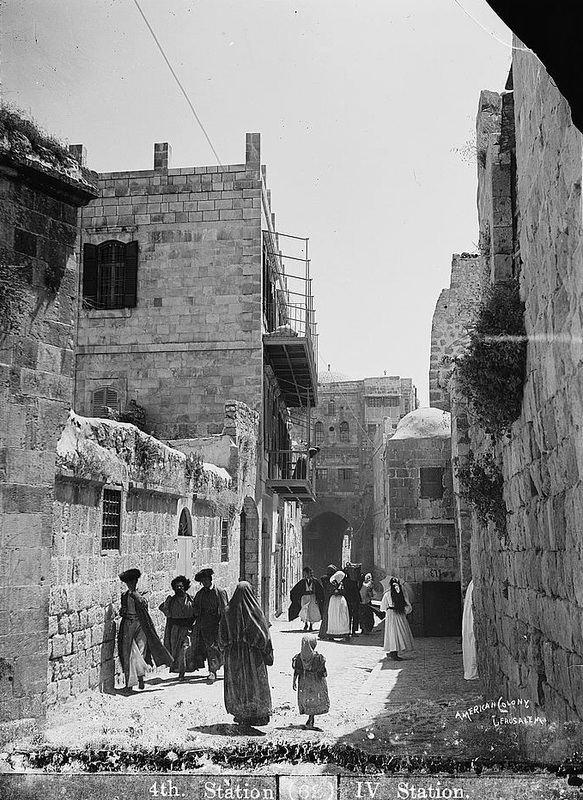 ﻿﻿﻿Several months ago we presented pictures of Jews walking through the Old City of Jerusalem 70-80 years ago in order to pray at the Western Wall on the Sabbath. Under Muslim-Turkish rule of Jerusalem, Jewish access to the Western Wall was often curtailed. After Britain's capture of Jerusalem in 1917, Arab terrorists led by Haj Amin el Husseini frequently attacked Jews in the Old City. And in the period of the Jordanian occupation of the Old City (1948-1967) it was outright impossible to visit the retaining wall of the Second Temple. After Israel's reunification of the city in 1967 and the rebuilding of the Jewish Quarter, Jews were able to take their traditional Sabbath walk to the Wall safely. Orthodox men walking in the Old City shuk (circa 1935). 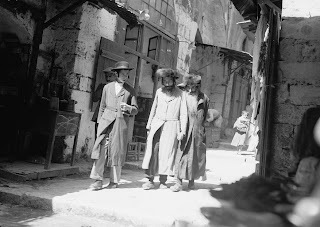 We present here additional historic pictures of Orthodox Jews walking in the Old City of Jerusalem, probably going to or returning from prayers at the Western Wall. In these pictures, the men are wearing fur hats - shtreimels - traditionally worn on the Sabbath or on a Jewish holiday. In one picture a man hides his face because he doesn't want to be photographed on the Sabbath. 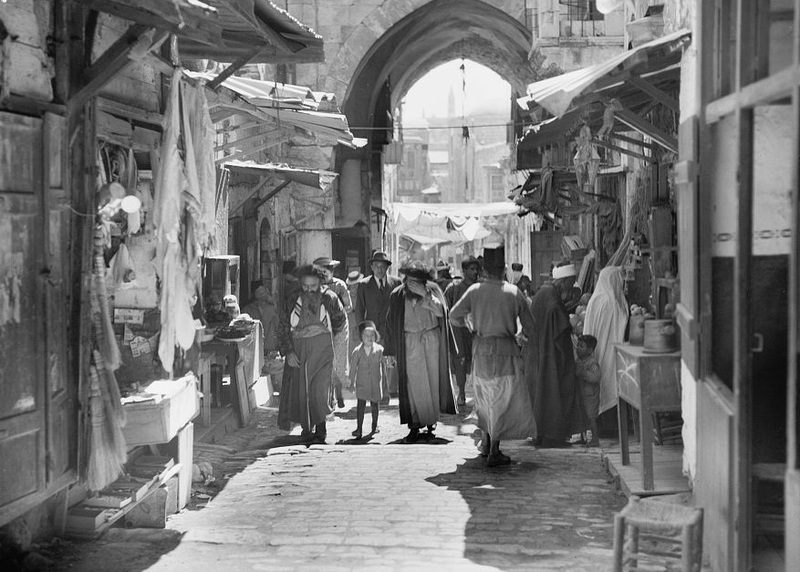 The stores are open which means they were walking through the Arab shuk. And the tower on the hill on the horizon is the 64-meter high bell tower adjacent to the Russian Orthodox Church of the Ascension on the Mt. of Olives. With the Mt. of Olives behind them, the men are walking toward the east and the Jaffa Gate. Note that on the right of your second photo there is a table with a curious scribble, which appears again on the left of the third picture. Also the shadows seem to fall in the same direction in both photos. This should indicate that they were taken maybe moments apart, only facing in almost opposite directions - upstreet and downstreet as it were. There's a window shutter near the table that appears to be identical. 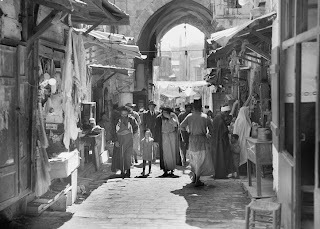 First picture is on the crossing of Via Dolorosa with El Wad Ha Gai near Yeshiva Kohanim. Two other pictures was taken on the spot, where the northern end of Misgav Ladach and HaKotel ends in the street which name I do not remember, but it is the border between jewish and arab quarter. There is an arch over HaShalshelet, immediately to the east of where Ladach joins that street, that can only be the one on the second picture. There is a whitish discoloration on the arch near the 10 o'clock position, and the blocks of stone on the wall to its left fit the 1930s photo exactly. To find the spot, type 31.776861,35.232854 into Google Maps. "[T]ype 31.776861,35.232854 into Google Maps"... then look east on Street View.